We are especially grateful to Andy George for taking time out in the middle of all his launch preparations to provide an insight into how he arrived at this new business, with a number of really interesting business initiatives. Andy’s career had always had a scientific / engineering bias. His area of expertise was in robotics; particularly very low volume liquid handling. Prior to this his experience was in nuclear research having worked at the Atomic Energy Research Establishment at Harwell and the Joint European Torus Project at Culham. The Tintagel, site where he had worked for thirteen years, closed in October 2012: work then moved to Loughborough in the midlands and Rockfield in the US. But due to poor health he was unable to relocate with the company. Andy’s disability has made conventional work challenging and was planning to adapt the way he has previously worked to better suit the restrictions imposed by health. The closing of the Tintagel site provided the springboard needed to move towards self employment. 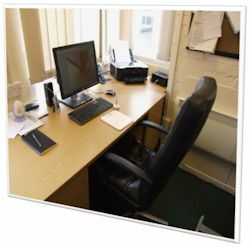 He needed a job that he would enjoy, operate from a home office and that could be adapted to suit changing health conditions. Andy has always led a very active lifestyle with hobbies such as sailing, free diving and photography. It was the long-held interest in photography that he particularly wanted to incorporate in his new business. The original plan was to provide a commercial platform for talented amateur photographers to display and sell their work. He would host online galleries on a site designed around a social media type site with competitions, forums, a members’ area for critique and advice, as well as tutorials. It was to be funded through the sale of members’ images, which Andy would print and ship, receiving commissions from sold images. The original thinking behind looking in to picture framing was in order to offer framing and mounting as an extra option for customers using his new on-line service. Andy felt this would provide a complete product, as well as further profit for the business. The training gave him the skill-sets required: from building a basic picture frame through conservation framing, fabric framing, 3D framing, to the tools and equipment needed as well as a useful insight into the management of a bespoke framing business. During the week of the training course, he recognised the significance of the actual framing and the value it can add to the finished product. Andy also found that he really enjoyed the process of making picture frames. He amended the original plan, deciding to make framing the main part of the business: the web galleries would support the framing business rather than the other way around. He purchased the equipment shortly afterwards, and spent the next few months building frames for family and friends, whilst adapting the skills he had acquired to suit his new kit. Then in February 2013 he attended a two day canvas stretching and sports shirt framing course at DIY Framing. Edgemoor Framing is due to open on April 8th. 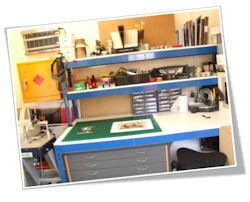 The workshop / studio is currently based at Andy’s home. He has a small detached stone and slate outbuilding, which he has converted into an office store and workshop. There are many benefits in this set-up: the premises are owned outright so no mortgage or rental to find each month; very close to home so travel costs are eliminated; any fatigue and health management are much easier; being free of lease contract / commitment allows a chance to see how viable this business actually is. Nothing is ever perfect and Andy recognises the limitations / issues of working from what are quite small premises (5 m x 3 m): you have to be methodical and work in a highly organised way. Then there is the problem of being so close to home distractions are frequent. And without that “high street” presence, it takes more work to fill the order book. He has kitted out his workshop with a Logan 855 Platinum Edge mount cutter, electric mitre saw with a hand operated mitre guillotine and the Alfa A2M-200 under pinner. For the printing side Andy uses an Epson Stylus Pro large format printer and a HP laser jet CP3505. Based in Delabole, North Cornwall, Andy’s idea of maintaining the interest in photography and therefore producing items for sale through the network of local tourist outlets seems completely feasible. In terms of the total business, he is initially aiming for 80% of his work to be on the bespoke framing side, with the remaining 20% being made up of image sales and those tourist gifts. 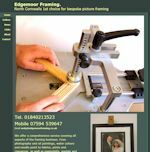 As mentioned earlier, Andy plans to launch Edgemoor Framing as a business on the 8th April. With the training, practice pieces and ongoing support from DIY Framing, he feels confident enough to accept any type of framing job that may come his way. He has a website (www.edgemoorframing.co.uk) and online gallery ready to go live on the launch day. Marketing of products and services are in place via adverts on local village web sites and in monthly newsletters. Finally, the plan is also to use social media sites to promote the business. In spite of all that’s about to take place over the next few weeks, it is good to hear that Andy feels that life is pretty stress free - must be the Cornish air. Everyone at DIYframing thanks Andy for taking time, at this busy point of his preparations, to provide us with so much for this case study. And of course we hope all goes exceptionally well at launch and we look forward to hearing how it all develops.